PAROWAN — Carol Adams Smith remembers the skinny kid who came out of the sheep meadows of iron ore country here to shock the flock of highly favored contenders in the 1912 Olympics in Stockholm, Sweden, and soar to the high-jump gold medal. "He was just a lanky farm boy running across the fields and jumping over the fences in preparation for his competitions," said Smith, who at 92 years young is one of a couple of people still in this hardy community of 2,008 who knew Alma W. Richards personally. Now that his home state appears prepared to reacquaint itself with Richards' heroic exploits, honoring him by routing the 2002 Olympic Torch Relay through this seat of Iron County, Smith is ready to perform her own dazzling feat if called upon. "I said I'd do it, didn't I? I will if they want me to. I'll carry the torch — at least past his old house," she said, speaking of the dormered bungalow trimmed in minty-green gingerbread, 25 S. Main, a couple of doors down from Old Junction 91 Pie and Ice Cream Parlor, the same building where Alma's dad, Morgan, once ran Parowan Mercantile. That would represent a nice present for the girl carefully called Carol Adams Smith because Adams is the name linking her to Alma Richards. His mother's maiden name was Margaret Adams. "But mostly I think it's wonderful they'd bring the torch here because Parowan is such a great place to live and raise a family, and Alma was an outstanding example of that quality of life here," Smith said. Like most residents, she was waiting with baited breath Tuesday for some word on the torch relay. The Salt Lake Organizing Committee said it won't officially announce a revised, final route until next Monday, but many signals have pointed to Parowan's inclusion. "We're so anxious, and it would be such a letdown if they didn't put Alma's hometown in this relay," said Carrie Shurtleff, 74, director of the Parowan Visitors Center and chairwoman of the Alma W. Richards Committee for the town's 150th birthday celebration last Jan. 13. 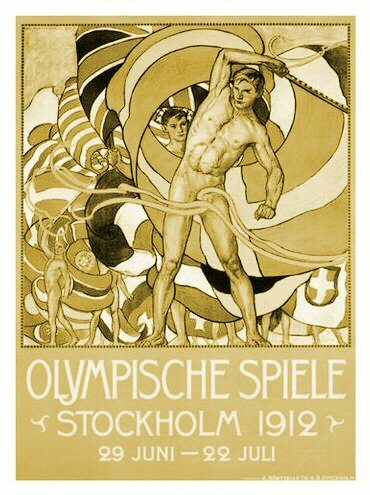 "He represents all the old Olympic ideals — the 'nobody' supposedly out of 'nowhere,' rising out of 'nothing' to win the prize. Does anyone mean Olympics more than Alma Richards?" Shurtleff asked with the gentleness of the folks they grow, sweet-natured, down here in the hothouse of southern Utah, but with the urgency of the mission to see her man properly recognized. A tour of town totems to Richards certainly makes one wonder how organizers could consider not honoring the only Utahn ever to win an individual gold medal. At the Iron County Courthouse, Shurtleff proudly joined Mayor Glen L. Halterman and Iron County Fair manager Art Walunas in hoisting a felt board displaying some 250 medals Richards won worldwide. The medals are next to the white woolen jersey, emblazoned with red-and-blue stripes, that Richards wore leaping to the gold as a 22-year-old, then out of Brigham Young High School in Provo. The jersey rests beside a picture of Richards clearing the bar with his patented "scissors kick," setting an Olympic record of 6 feet, 4 inches. Close by are pictures of jalopies parading in Provo, echoing Richards' traditional ticker-tape tribute down Fifth Avenue and Broadway in New York. "It took me three whole days to get all this stuff together," Mary Schraeger, 68, Richards' daughter, who lent her dad's memorabilia to Parowan, said by phone from Carlsbad, Calif.
"You know, I knew Dad was a great athlete and all, but it really wasn't until I started going through his stuff that it sunk in what a truly amazing, amazing talent he was." Seconding that, Walunas produced a scrapbook photo showing Richards standing by Jim Thorpe, the legendary American Indian from Carlisle, Pa., hailed in his day as the "world's greatest athlete." 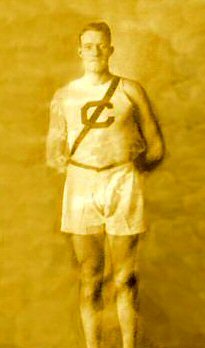 "Richards beat Thorpe every single time they went head to head," Walunas said, digging out newspaper accounts saying the same thing — especially after Richards won the Amateur Athletic Union decathlon at the 1915 World's Fair in San Francisco, beating Thorpe's 1912 Olympic gold-medal score by more than 1,000 points. Lining up as another sentinel to history is a picture of Gen. John J. Pershing pinning a medal on 1st Lt. Alma W. Richards, Co. K, 8th Infantry, 8th Division, after Richards dominated the American Expeditionary Forces Track and Field Championships, June 1, 1919, in Paris. "Pershing called Alma 'the finest athlete in the U.S. Army,' " Shurtleff said, referring to Richards entering 10 events, taking two firsts, a second, a third. Shurtleff and Halterman stopped by the Parowan cemetery where Richards was laid to rest next to a grove of cedar trees, hard by Red Hill, after dying at age 73, April 3, 1963. Though Richards attained degrees at Cornell and Stanford universities, took a law degree from Southern California University and taught science in a Venice, Calif., high school for 32 years, he never really left Parowan in his heart. "His dying wish was that he be brought back here," Halterman said. Over at the Old Rock Church museum is a picture of the Richards clan, showing Alma as the ninth of 10 children, and explaining why he was known as "Pat" to his contemporaries. "It was his Irish background — here's a picture of his grandmother, from County Down in Ireland," said Jackie Robinson, captain of the Paulina Camp of the Daughters of Utah Pioneers, pointing to an oval-framed photo of Mary Ann Leech Adams. They hauled out clippings harking back to when Richards dropped out of school but later attended Murdock Academy in Beaver, leading the tiny school to the 1909 Utah state high school track and field title. "He scored all 32 points all by himself," Shurtleff said. They told how Richards harbored grave doubts after transferring to B.Y. High and making the U.S. team. He'd been added as an afterthought "supplemental" choice. "Many thoughts went very rapidly through my mind," Richards wrote later of his moment of truth in Stockholm. "I thought of Parowan, my folks, B.Y.U., Utah, my people — that I was representing our Country against a fine athlete from another Country. I felt weak and as if the whole world was on my shoulders. As I walked back to make my jump, I said a prayer and asked God to give me strength and if it was all right that I should win — that I would do my best to set a good example all the days of my life. "The weight went off my shoulders and my confidence returned. I cleared this winning height on my first jump and a new Olympic record . . . ."